Based on the book of the same name by Andy Weir, The Martian is a science fiction film that takes place on – you guessed it – Mars. Instead of little green men, however, the movie focuses its attention on a team of astronauts known as the Ares III. Among these astronauts is a botanist named Mark Watney (played by Matt Damon), who becomes stranded after a sudden storm forces his crew to vacate the planet without him. Alone and assumed to be dead, Watney is forced to survive on a desolate planet with limited resources while he attempts to contact NASA for help. Ridley Scott already has a few space epics under his belt with Alien and Prometheus, so it was easy to tell he was in his element while filming The Martian. Though I’d never really considered the red planet to be beautiful, certain shots of the sun cresting over distant, crimson mountains were outright stunning. One aspect that had me concerned going into the movie was its likeness to Interstellar, which only came out a year prior to The Martian’s release. Interstellar is a cinematic masterpiece in its own right, but no one likes seeing a regurgitated plot thrown back at them with a slightly different cast. Luckily, the only real similarity is that Matt Damon’s character is once again stranded on an inhospitable planet. Unlike Interstellar, The Martian takes a much more lighthearted approach in its storytelling. Even though Mark Watney is faced with innumerable odds during his stay on Mars, he never loses his sense of humor. However, the film still retains enough tension (or should I say gravity) for the audience to take it seriously. The movie already had an impressive cast with faces like Jessica Chastain, Kristen Wiig, Kate Mara, and Chiwetel Ejiofor, but Matt Damon stole the show. His straight-faced humor gave the movie that extra dimension it needed to stand out in a horde of intergalactic films, not to mention the comic relief that was necessary to break up all the suspense throughout. With a run time of almost two and a half hours, The Martian is a bit lengthy, but it never had me glancing down at my watch. I was so engaged throughout the movie that I didn’t even notice the length until leaving the theater. 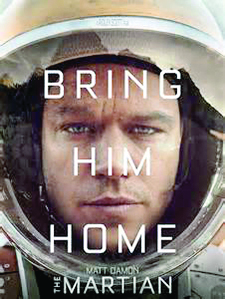 One of the best things about The Martian is how desperately you want Mark Watney to survive. He’s got enough ingenuity to make his character interesting, but he makes enough mistakes to be human and – perhaps most importantly – relatable. It’s been a while since I’ve seen a movie that had me so genuinely worried and invested in the main character. No matter what, The Martian will have you rooting for Mark Watney from beginning to end.